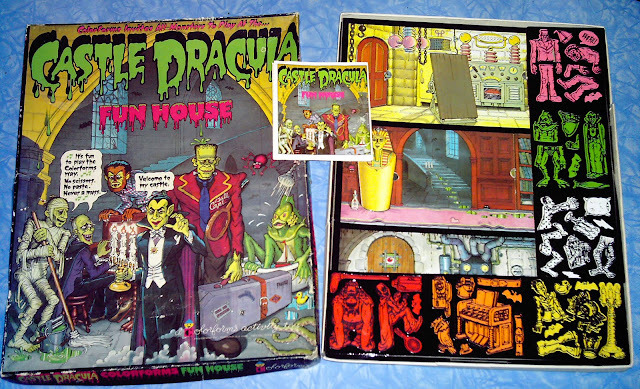 It's taken me 30 years, but I've just finally replaced one of my all-time favorite childhood toys: the Colorforms Castle Dracula Fun House Playset. Considered by Colorforms aficionados to be one of the best sets ever created, it's also sought by vintage monster toy collectors, which tends to drive its price to truly horrific levels. After several years of lost auctions, I broke down and bought this from a dealer who sells all of her sets in individual lots. That is, she sells every single piece in a set separately. The intent is to enable collectors who are missing a few bits to buy just the pieces they need, instead of another whole set. In my case though, this led to 20 minutes of frantic clicking and buying, particularly as this set has characters with separate tops and bottoms. I bought the Frankenstein monster's head and torso; would I manage to complete the purchase of his bottom half before someone else beat me to it? And the Wolfman was even worse: he had a top, bottom, and frequently-lost separate arm. The tension was unbearable as I raced to complete his three separate purchases, worrying that I would end up spending a small fortune only to have an incomplete set, full of monsters missing vital body parts. Fortunately there were no other missing parts monster collectors looking at the same time, and I managed to get everything I needed. And the lucky dealer got enough from me to make her car payment, I would guess...but hey, I got my monster Colorforms back! I've been looking for pictures of this thing for years now! I couldn't remember what it was called or who made it (lost mine many years ago), but this is it. Thank you for the memories, and I may have to start scouring eBay for my own now. Any chance you could post a high quality picture of the entire house itself? I will do my best to get a good picture of the house up soon (probably have to be after the holidays, though). Wow...I have been looking for this! My brother and I used to play with it all the time. The doors would open too. I remember we took the extra red piece (found in between the gorilla's legs) and make believe it was a drop of blood! 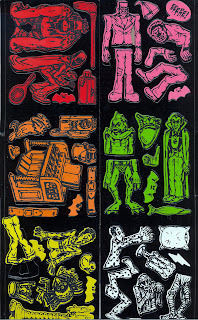 This was my all time favorite toy as a child - I had quite a collection of Colorforms - but this was by far my favorite. I found one on Ebay a few years ago - it is missing only a couple of pieces and I got it for a steal at $20. I also cried when it arrived in the mail. It's nice to know someone else shares my enthusiasm. :) My children don't understand my excitement...Ha! My mother bought this set for me the night of the '76 presidential election because nothing else would be on television (only about 4 or 5 channels on tv back then)and she thought this would help me avoid the boredom. I loved this set! Sadly, like many others, mine is now gone as well. Thanks so much for posting scans of the contents and artwork...this is priceless! That's a great story: thanks! And similar to my own: my parents bought me my original set when I was very ill as a child, to keep me entertained while in bed. It worked: I played with this toy for hours on end. Great photos of the set on this other blog - Sadly, I too loved this set and have no idea where it went. I had this set and the KISS colorforms set as a kid. Tracy you may have inspired me to try to find the same set again. Other toys as a child I'd love to share with my son was the Kenner Stars 'n Stripes Smash up Derby set and my Evel Kneivel motorcycle set. Great toys from the late 70s. BTW I'm Tom from central California. Had to out anonymous cuz nothing else worked LOL!! Hi Tom! Glad you liked the Colorforms post. Don't you think we had the BEST toys ever, back in the '70s? And I think the Evel Kneivel motorcycle set has actually been re-released: I'm pretty sure I've seen it somewhere. It is very gratifying to me as the designer and illustrator of CASTLE DRACULA FUN HOUSE play set to know that so many of you all enjoyed playing with it as a child and want to continue the pleasure as adults - Thank you! Dear Bill: I'm so glad you found this little blog post and all its comments! Your work made a lasting impression on a lot of young minds, and still brings us all a lot of pleasure even now, in the midst of our stressed out, middle-aged lives! Thank you very, very much! Bill even got a mention there.